Dr. Floyd E. Lacey, Sr.
United States Army Chaplain. Highest military awards and decorations include the Legion of Merit), Bronze Star Medal(3)(Viet Nam), the Meritorious Service Medal(2), and the Army Commendation Medal(3), and others. 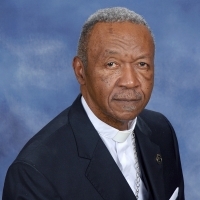 Director, Division of Christian Education, Sunday School Publishing Board, Nat’l Baptist Convention, USA, Inc.
Director, Chaplains Professional Development Institute, NBCUSA, Inc. Member, National Education Committee, NBCUSA, Inc.
Chairman, Personnel Committee, TBM&E Convention (TBMEC).